The change in seasons and daily life make it difficult to get rid of dust. However, a handful of tips improve indoor air quality. Take these tips from Warner Service. Use a vacuum fitted with a high efficiency particulate air (HEPA) filter instead of a broom to clean dust. Get rid of carpets. Dust clings onto carpets, and carpets produce their own pollutants from the fibers. If you keep your rugs, wash them in hot water weekly. Use a microfiber cloth to clean dust instead of pushing it around. Microfiber cloths have positively charged ultra-microfibers. These microfibers pick up dust and its microscopic pollutants. Leave shoes at the door. Shoes are a common way to bring outdoor pollutants inside. Choose a natural doormat with fibers that capture dirt and liquids. Wipe shoes off on this doormat before going inside. Buy a high-quality air purifier with HEPA and electrostatic filters. The air purifier should also use photocatalysis technology. This technology replicates how outdoor air is naturally purified. Caulk and seal cracks and crevices to prevent dust from accumulating in hard-to-reach places. Equip the forced-air heating or cooling system with high-quality filters. Change the air filters monthly to keep dust away. Keep electronic equipment dust-free by dusting it with a microfiber cloth. Laptops, televisions, and other equipment are common sources of chemical fire retardants in dust. Inspect household foam products made before 2005. This can include stuffed/upholstered furniture, nursing pillows, padded highchair seats, portable crib mattresses, baby changing pads, and chair cushions. These older products likely contain polybrominated diphenyl ethers (PBDEs). Replace anything with a ripped cover or misshapen foam. If you can't replace it, keep the covers intact and clean them often. Stick to household furniture with natural fibers. This includes wood furniture, cotton, down, and wool. These natural fibers are fire-resistant and contain fewer chemicals. Clean up after a home improvement project. 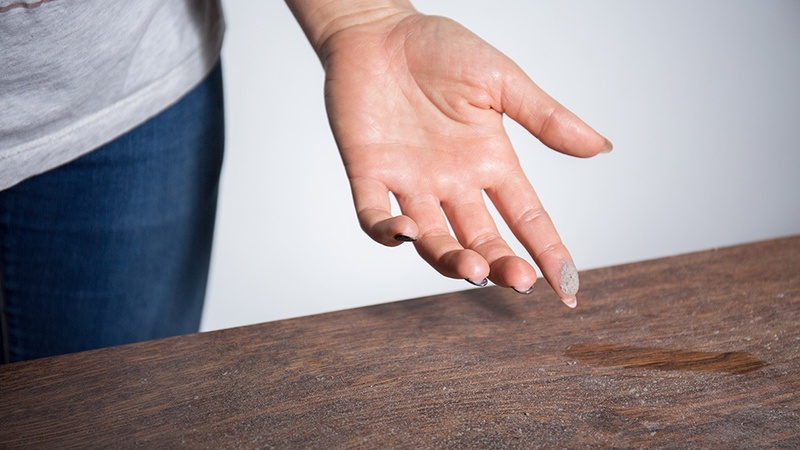 Home improvement projects involve dust from sanding, drilling, and toxic construction products. These products often also contain lead, polychlorinated biphenyls (PCBs), and fire retardants. Invest in the Air Scrubber by Aerus. This device is one of the best indoor air quality products. It works 24/7 using proprietary lightwaves and a specialized catalytic process to “reduce dust, pet dander, and odors in your home.” For more information on this product, click here. Organize closets. Every time the door opens, an invisible dust storm from clothes, towels, and bedding erupts. Keep closets easier to clean by boxing or bagging items on shelves. Clear plastic containers are best, because they lock fibers in and dust out. Slip garment bags or large garbage bags over winter coats. This contains fibers and keeps clothes from coating with dust. Finally, keep closet floors clear. If the floor clutters, dust bunnies collect.